Rocking sifters are designed primarily for two person use (one person, shoveling, loads the screen, while the second person rocks the screen). However, one person operation of our rocking sifters is possible. 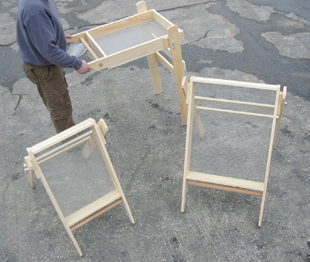 For sole operation, leave the rocking sifter folded closed on the ground, fill the screen mesh box and lift into an upright position using our front lateral dowel. We also offer a removable third leg that allows rocking sifters to be selfstanding on flat terrain as an optional feature. Our standard size sifters have 42” legs with four position adjustable height. The pivot point is located on the far end of the box. Center pivot legs are also available. The screens are durable, yet surprisingly light and easy to carry. Stoney Knoll products are intended for legitimate use by properly qualified members of the archaeological, scientific and law enforcement communities. We will not sell our products to anyone who traffics in antiquities, or who violates local, federal or international laws protecting archaeological resources, and we pledge our full cooperation to agencies investigating and prosecuting any such violations. It is our company policy to ship solely via UPS Ground, which services only the United States, Puerto Rico and most of Canada. If you are interested in international orders please contact us directly.